passing from one position in which the fringes disappear to the next. If the two homogeneous trains of waves have the same intensity, then the two sets of fringes will be of the same brightness, and when the bright fringe of one falls on the dark fringe of the other, the fringes disappear entirely. 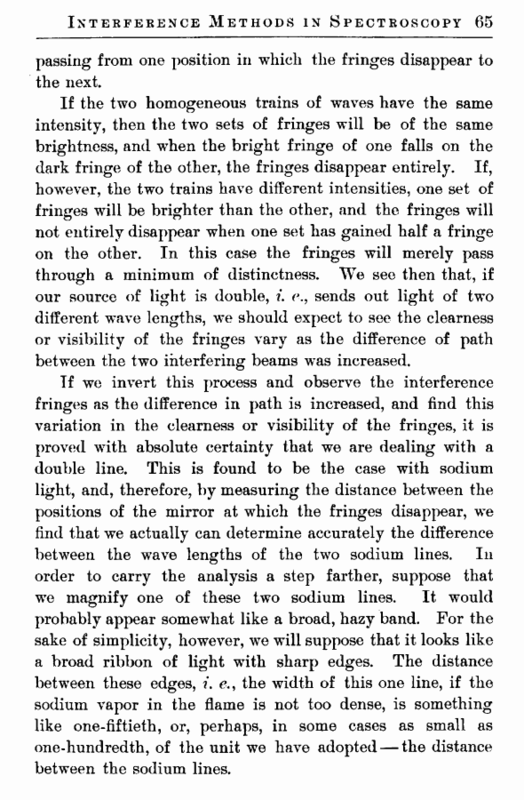 If, however, the two trains have different intensities, one set of fringes will be brighter than the other, and the fringes will not entirely disappear when one set has gained half a fringe on the other. In this case the fringes will merely pass through a minimum of distinctness. We see then that, if our source of light is double, i. e., sends out light of two different wave lengths, we should expect to see the clearness or visibility of the fringes vary as the difference of path between the two interfering beams was increased. If we invert this process and observe the interference fringes as the difference in path is increased, and find this variation in the clearness or visibility of the fringes, it is proved with absolute certainty that we are dealing with a double line. This is found to be the case with sodium light, and, therefore, by measuring the distance between the positions of the mirror at which the fringes disappear, we find that we actually can determine accurately the difference between the wave lengths of the two sodium lines. In order to carry the analysis a step farther, suppose that we magnify one of these two sodium lines. It would probably appear somewhat like a broad, hazy band. For the sake of simplicity, however, we will suppose that it looks like a broad ribbon of light with sharp edges. The distance between these edges, i. e., the width of this one line, if the sodium vapor in the flame is not too dense, is something like one-fiftieth, or, perhaps, in some cases as small as one-hundredth, of the unit we have adopted — the distance between the sodium lines. This is proved by noting the greatest difference in path which can be introduced before the fringes disappear entirely. This distance is different for different substances, and the greater it is the narrower the line, i. the more nearly does it approach the ideal case of a source which emits waves of one period only. Now, experiment shows that the fringes formed by one sodium line will overtake those formed by the other in a distance of about five hundred waves, corresponding to about one-third of a millimeter, and that we can observe interference fringes with sodium light, under proper conditions, until the difference in path between the two interfering beams is approximately thirty millimeters. This means that the width of the band is something like one-hundredth of the distance between the two bands. The width of a single line can be appreciated in the ordinary spectroscope when the sodium vapor is dense, and under these conditions the fringes vanish when the difference in path is only one-half inch, or even less. When we try to make the source bright by increasing the temperature and density of the sodium vapor in the flame, the band broadens out to such an extent that the difference in path over which interference can be observed may be less than one-hundredth of an inch. 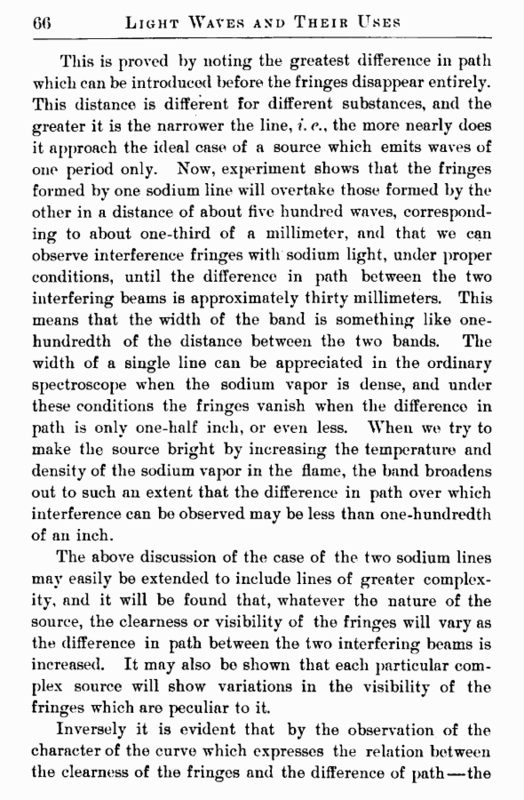 The above discussion of the case of the two sodium lines may easily be extended to include lines of greater complexity, and it will be found that, whatever the nature of the source, the clearness or visibility of the fringes will vary as the difference in path between the two interfering beams is increased. It may also be shown that each particular complex source will show variations in the visibility of the fringes which are peculiar to it.